There are creatures so bizarrely beautiful and so beautifully bizarre, it seems impossible to imagine a world without them. 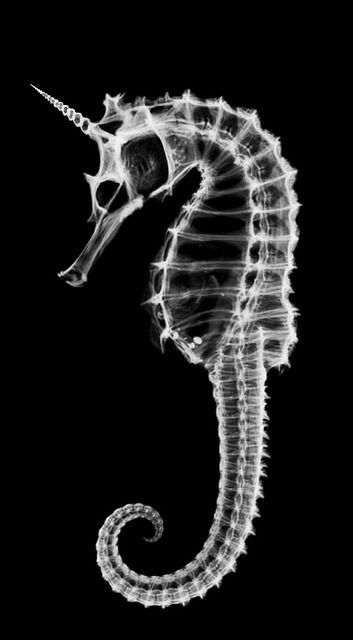 The mesmerizing, almost mythical seahorse has inspired the fantasy of poets throughout the ages. Roman poets of the Republican and Augustan periods, like others before and after them, imagined the seahorse as an animal that was given the honour to serve the sea-gods – just like dolphins. 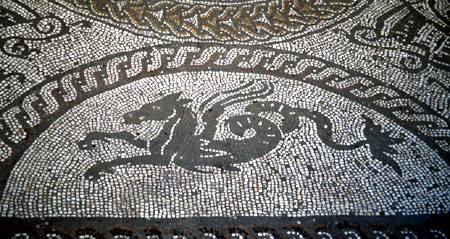 Seahorse mosaic from the Roman palace at Fishbourne (Sussex). – Image source: http://www.vroma.org/images/bonvallet_images/bonvall41.jpg. Tyndaridae niueos mirantur uirginis artus. two-footed steeds, Leucothea, and little Palaemon with his goddess mother. At her, too, marvel they who live by lot alternate days, the dear offspring of Jupiter, mighty seed of a Jupiter to be, the Tyndaridae, who marvel at the maiden’s snowy limbs. News reported that seahorses have now virtually disappeared from Studland Bay, Dorset, and the Isle of Wight, a result of excessive boat anchors and illegal moorings as well as recent decisions to formalise such arrangements. Hopefully it’s not too late quite yet to do something about this – and to show consideration for those animals that, once upon a time, lent their mythical horsepower to the sea-gods. This entry was posted in Poetry and tagged Big questions, Biodiversity, Mythology, Seahorses, Sustainability, Vergil. Bookmark the permalink.